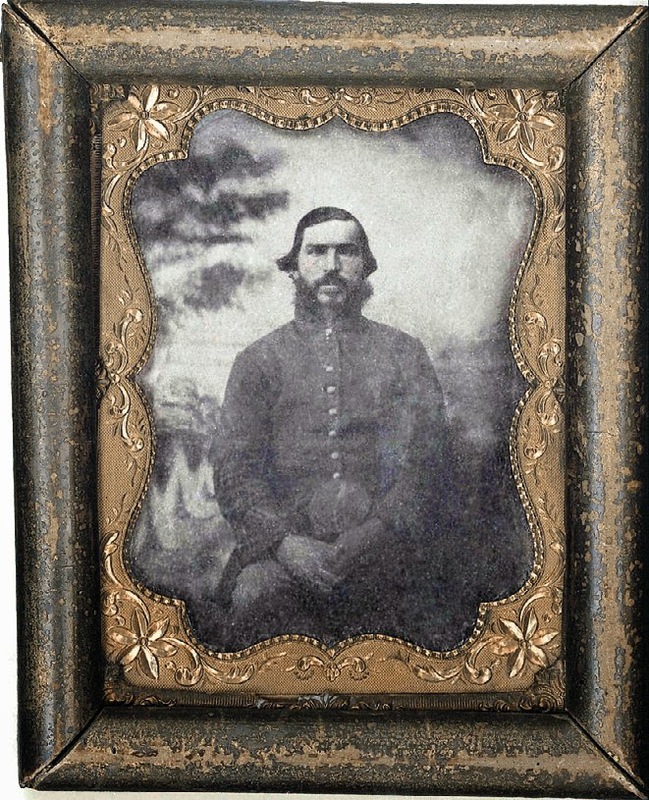 My great-great grandfather, Peter Maxwell, enlisted into Company F of the 20th Michigan Infantry in the Union Army during the Civil War. 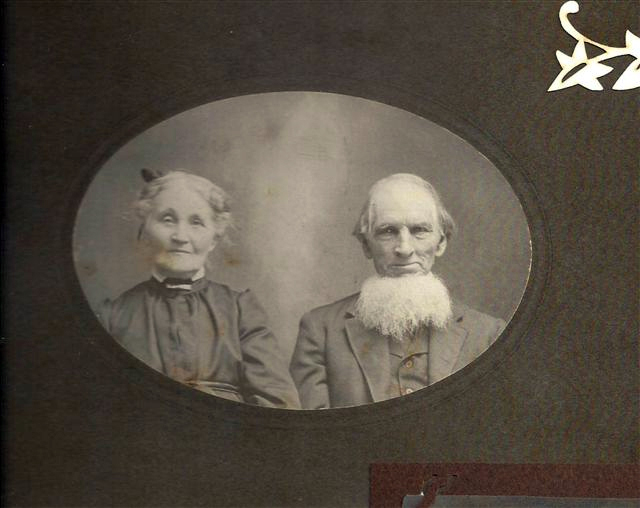 He was one of the oldest enlisted men at age 34. The majority of Company F were just boys in their late teens and early 20’s...most of them died. Peter survived, but with a crippled hand. The reason I know of Peter’s story is due, in part, to my grandmother, Eulah Maxwell Wills who told me stories of Peter’s tribulations. She actually knew her grandfather, Peter, since she was in her early teens while Peter was still alive. 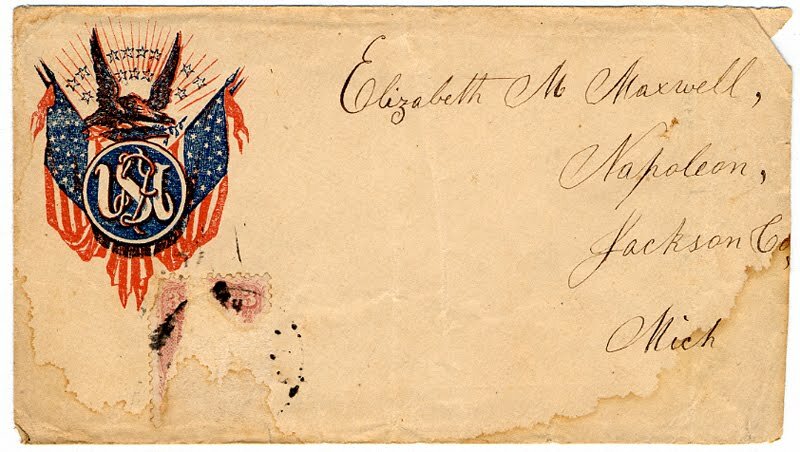 Often, Eulah would recount to me how she had caressed his crippled hand and recited the story of how his company had been reviewed by President Lincoln and described the grand horse Lincoln rode that day. She also told me the terrible story of how all his children had perished from sickness while he was away at war. Fortunately for me, Peter started over after the end of the war. Peter’s life always intrigued me as a boy. However, his sacrifices were not apparent to me until I was much older. I still can not imagine what his family endured while he was gone. We do remember you, Peter. 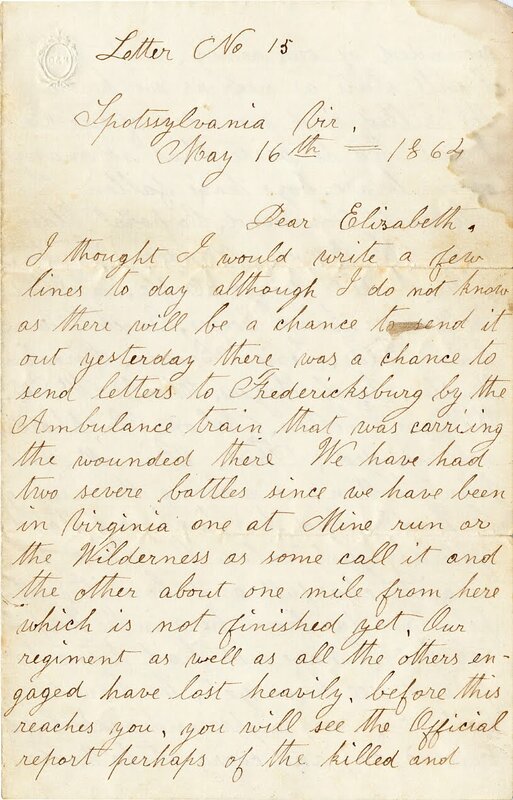 I thought I would write a few lines to day although I do not know as there will be a chance to send it yesterday there was a chance to send letters to Fredericksburg by the Ambulance train that was carrying the wounded there. We have had two severe battles since we have been in Virginia one at Mine run or the Wilderness as some call it and the other about one mile from here which is not finished yet. 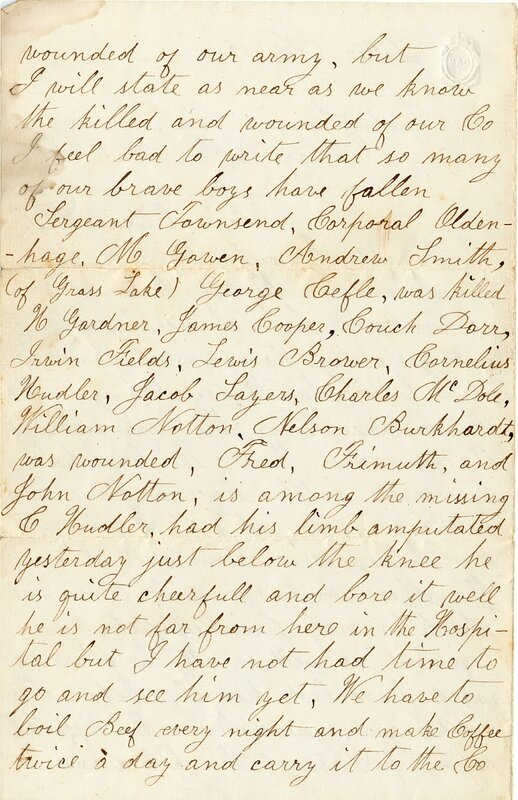 Our regiment as well as all the others engaged have lost heavily, before this reaches you, you will see the Official report perhaps of the killed and wounded of our army, but I will state as near as we know the killed and wounded of our Co. I feel bad to write that so many of our brave boys have fallen Sergeant Townsend, Corporal Oldenhage, M. Gowen, Andrew Smith (of Grass Lake), Geogre Cefle, was killed, H Gardener, James Cooper, Couch Dorr, Irwin Fields, Lewis Brower, Cornelius Hudler, Jacob Layers, Charles McDole, William Notton, Nelson Burkhardt, was wounded, Fred, Frimuth, and John Notton, is among the missing & Hudler, had his limb amputated yesterday just below the knee he is quite cheerfull and bore it well he is not far from here in the Hospital but I have had time to go and see him yet. 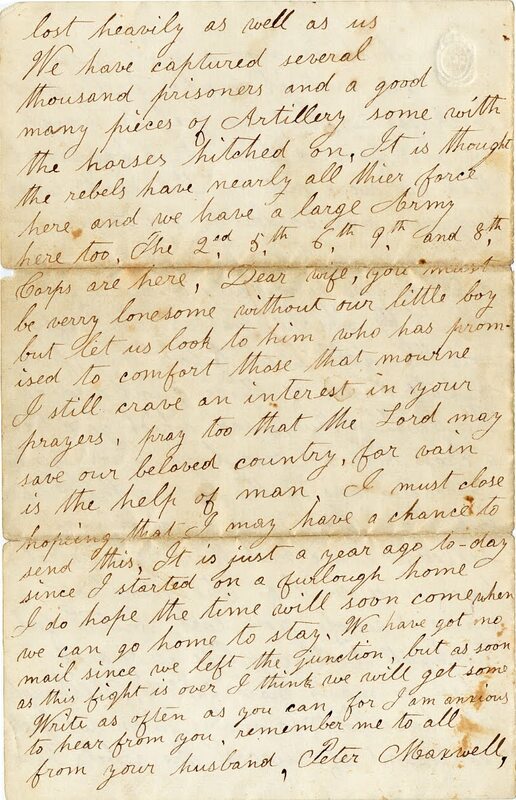 We have boil Beef every night and make Coffee twice a day and carry it to the Co. which is over a mile from here and it makes pretty hard work for us, but we feel as though we were favored, that it so happened that we were not in the ranks when Our men was so badly cut down. 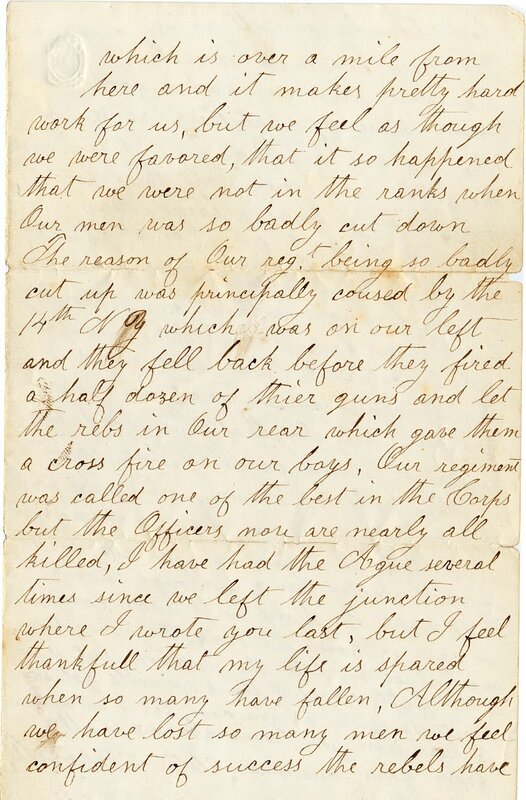 The reason of Our reg't being so badly cut up with principally caused by the 14th NY which was on our left and they fell back before they fired a half dozen of their guns and let the rebs in Our rear which gave them a cross fire on our boys. Our regiment was called on the best in the Corps but the Officers now are nearly all killed. I have had the Ague(1) several times since we left the junction where I wrote you last, but I feel thankfull that my life spared when so many have fallen. Although we have lost so many men we feel confident of success the rebels have lost heavily as well as us. We have captured several thousand prisoners and a good many pieces of Artillery some the the horses hitched on. It is thought the rebels have nearly all their force here and we have a large Army here too, the 2nd, 5th, 6th, 9th, and 8th Corps are here. Dear wife, you must be verry lonesome without our little boy(2) but let us look to Him who has promised to comfort those that mourne. I still crave an interest in your prayers, pray too that the Lord may save our beloved country, for vain is the help of man(3). I must close hoping that I may have a chance to send this. It is just a year ago to-day since I started on a furlough home I do hope the time will soon come when we can go home to stay. We have got no mail since we left the junction, but as soon as this fight is over I think we will get some. A fever (as malaria) that is marked by paroxysms of chills, fever, and sweating that recur at regular intervals. Peter’s young son Frankie had just died. His daughter Francis died earlier during the War.